guys you know this thing is fully Eurorack compatible right? i don't understand why you're all so keen to take breadknives to it to make it fit into a 3U rack, given that a huge part of the appeal of this thing is that it's insanely portable. Hmm, the MS20 is not V/oct but V/Hertz, right??? Yeah, you're not going to get tracking on an MS-20 straight out of a V/oct CV output. There are some tricks you can do to get it without a straight converter, (forgot where, but it was in a thread here) but you need to convert it. The polarity of the gate is reversed as well. Damn I worded that wrong. I tried the 0coast cv out in the -5V/+5V TOTAL and -5V/+5VPitch patch points, which should track V/oct with some tweaking. It didnt work, and I have no other V/Oct synths to test with. Yeah, I'm having issues getting Midi B's cv out to work as advertised too. 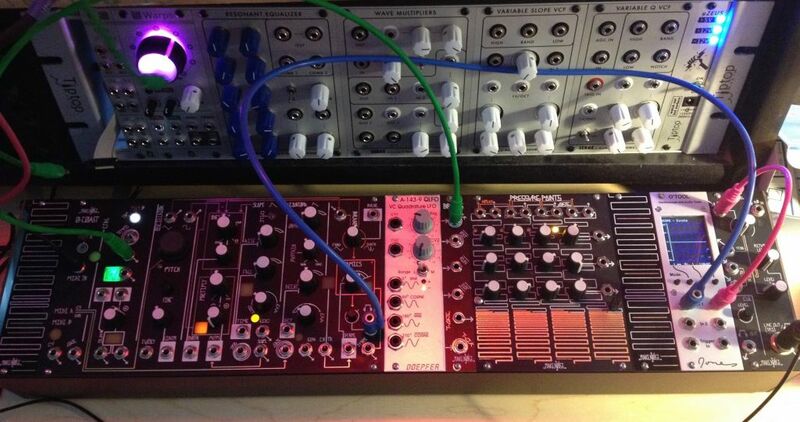 (I'm actually doing the same thing, was hoping to use the 0 coast w/ a makenoise skiff too.) Triple checked the settings in the manual to make sure I'd followed instructions properly, but no dice. Can get the MIDI B gate out to send out a gate on note on from my keyboard, but the tracking from the cv is not happening. Tried it with a tides (in osc mode) and just plugging it into the v/oct for the 0 coast's own oscillator, and the pitch was super high and not tracking even close to accurately. Anyone had any luck getting this feature to work on theirs? Was hoping to use it as a MIDI-cv interface w other oscs, but obviously this throws a wrench in the works. Am writing Make Noise to see if they can help out. Had to share this with you all... just received the Retro Mechanical Labs "Electron Fuzz Custom" pedal, and paired up with the Make Noise 0-Coast really makes for a killer combination! This was 5 minutes after unboxing the Electron Fuzz... the second part is the best to me, at around the 2:43 mark. Fits and works off euro power. (with slight soldering) The main board runs on 12v anyways via a KA78R12 voltage regulator. Would someone with a scope please describe the behavior of the Overtones circuit? Or better yet, post a video! The two downvotes on youtube...wtf? People are asses. Thank you so much! This is amazing. Second, how are you powering it, and what sort of soldering did you have to do? I've been looking at assembling a 0-coast-like system using existing MN modules, but at much greater expense. If I could get another FRAP half-case at 42HP and shove this thing inside it somehow...would save a ton of money, and I wouldn't have to worry about matching its capabilities with other modules. Thanks again for your report and the look inside! Power is fairly simple, find + and Ground voltage points by the barrel plug, modify a euro rack cable and solder up. Alternatively, you could get a plug for the power jack and modify that to connect with euro power bus. Power is still tentative as I'm sure people will chime in with new ideas. Also, if you don't know basic electronics, don't do it and let someone else do it. Or better yet, just use the supplied AC adapter and just run the cable out through a hole in the rack or something. i hope they can replace those missing parts soon. the good news is that the psu is a multi-regional one that comes with adapters for different sockets. so there is no trouble using a unit bought in the uk on a euro mains socket. i'm on a bit of a tight schedule this w/e, but i was able to spend about an hour with it last night, and my first impression is pretty much what others have already said: it's a very elegant instrument, excellent feature set in a compact package, brilliantly laid out, very intuitive, great sound. love it! Fits and works off euro power. I wondered the same thing as Slabwax. Why would you take it out of its own case and put it in another that is roughly the same size? I'm interested in putting it into a case shared with my other modules. A few reasons. Portability; easier to move around if there's fewer separate units to juggle. Also power. Sharing mains power is important when you have a limited number of outlets, as I do. And completion: I really like the idea of one self-contained instrument, in-line with my other modules. Removed from its case, the 0-Coast isn't much more than 42HP, and I've had a hard time narrowing down similar modules to do some of the same tricks, paired with my existing 42HP Clouds/Tides rig. STO, Function, Optomix, and a sequencing utility or two is the best I've gotten so far to the 0-Coast paradigm, with only 8HP leftover in a hypothetical 84HP case. A 104HP case with my existing rig, a modded 0-Coast, and sequencing utilities, still has about 10HP leftover for other purposes. It's also much cheaper to put a modded 0-Coast in a shared case with my existing rig than to buy several MN modules attempting to replicate its functionality! With the benefit of being more portable for live playing, and easier to power. That is an obvious answer, but also read two posts above yours. Space and cash are precious, and this thing is cheaper and takes up less HP than separate modules to perform the same functions. If you're using it with an existing modular setup, you can simplify by packing just one case and power supply, with the 0-Coast racked in it. Seriously considering getting one and even mounting it in an eurorack case to kickstart my system as it is just a fledgling. Anyone know if the front panel is metal? Also the power requirements if using eurorack power? I have a 4ms row power, currently 400ma left on +12v. Sonic state now have a pretty informative review up. yes, it is informative, as usual. excellent overview of the 0-coast's many functions and capabilities. it does seem to contain some errors, though (no, the midi adapter is not compatible with arturia's standard, but with korg's instead. and no, i wouldn't call this a 'fully modular synth' even though it has plenty of eurorack-compatible patch points; but the multiplier is hardwired to the internal osc and doesn't have any audio i/o patch points, for example). i completely agree with nick's assessment that this synth is pretty west-coasty overall, rather than being 'coast agnostic' as its name would suggest. do you know if the TIME input of the SLOPE section is calibrated to 1v/oct? It is Exponential, but not trimmed to 1V/ Octave. If you run the MIDI Calibration routine (Program Page 7) you can calibrate MIDI_B CV to drive the TIME CV IN for the SLOPE circuit and SLOPE will track about 5 octaves very nicely when controlled via MIDI. We will create a video that shows this very soon. I discussed "no coast synthesis" with Sonic Nick quite a bit as he was creating this video. I did not invent no-coast synthesis, I merely coined the term for what I was seeing happening in the world of eurorack modular systems for the past few years. 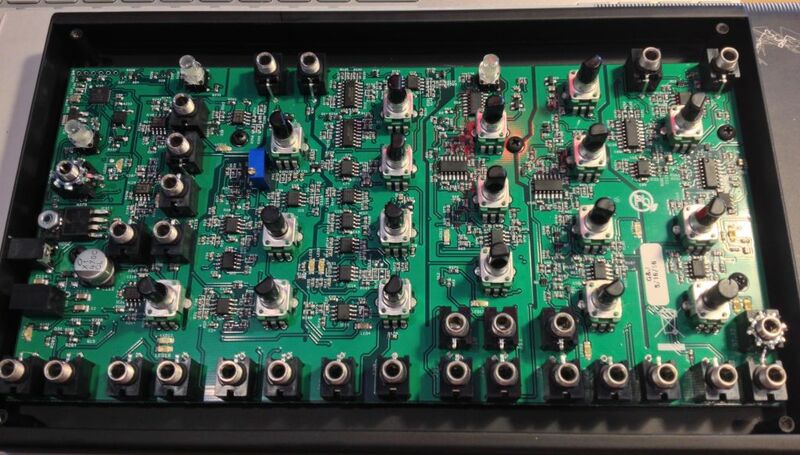 People have been building eurorack systems, and even designing modules, that cross pollinate the synthesis techniques pioneered on the East and West Coasts! This seems to be a rather recent development. The first person I ever saw doing "no-coast synthesis" was Grant Richter with his Boogie Filter which used the Vactrol Based LPG circuit to implement a 24db Low Pass Filter. Grant's approach inspired me to design a Low Pass Gate (west coast synthesis element) using a fast transistor based VCA (East Coast circuit topology) so it could be driven with the highly East Coast ADSR synthesis element. To me the MAJOR difference in the West and East Coast instruments is in how they were played. The West Coast instrument was played largely with sequencers and touch controllers, while the East Coast instrument used the traditional manual organ style keyboard, and the key circuit in making the organ manual keyboard work well with the East Coast Synthesis engine was the ADSR, not the Low Pass Filter. Without an ADSR a MiniMoog would have been quite a different instrument, perhaps not even so popular! I believe the use of the organ style manual keyboard is also largely responsible for putting the Moog synthesisizer in front of millions of people as Rock and Pop stars used it on stage along side their Hammond B3, Wurlitzer and Rhodes Pianos and other keyboards. Meanwhile the Buchla instrument remained largely hidden in academic music studios. My words here are NOT the final history of these great synthesis revolutions! These are merely my interpretations of what I have read and experienced. yes, it is informative, as usual. excellent overview of the 0-coast's many functions and capabilities. it does seem to contain some errors, though (no, the midi adapter is not compatible with arturia's standard, but with korg's instead. and no, i wouldn't call this a 'fully modular synth' even though it has plenty of eurorack-compatible patch points; but the multiplier is hardwired and doesn't have any audio i/o patch points, for example). i completely agree with nick's assessment that this synth is pretty west-coasty overall, rather than being 'coast agnostic' as its name suggests. anyway, whatever coast it's from, it's a brilliant instrument! There is 3 regulators actually. You mentioned the +12VDC regulator. There is also one for -12VDC and +5VDC. It is designed to run from about 320mA at +15VDC. If you run it at +12VDC it will consume around 400mA and there will be greater demand on power up as you would be powering an entire additional power supply circuit, not a module. Running from +12VDC there will be less noise immunity but since most euro rack power supplies are pretty quiet, you will likely not experience any problems. If your euro rack supply is noisy or out of spec you could have trouble. The reason we do not market the 0-COAST as a module is because it is not a module. Make Noise already has a whole line of modules! I helped Tony put together the "no-coast" presentation for Moogfest (later filmed at Continuucon), and one thing we frequently found during research is that the similarities greatly outweighed the differences. In fact that once you looked closely the distinction breaks down very quickly. An example is Patrick Gleeson, from the West Coast school, playing the "East Coast" Arp in a band with Herbie Hancock on Sextant, but in a "West Coast" style, which seemed to lead directly to Hancock playing his Arp in an "East Coast" style on Head Hunters... etc. But this has has all been discussed many times over on this forum. In many ways it is more a fun thought experiment. Modern modular synthesis has been disconnected from the coast for awhile now, thanks to pioneers like Grant Richter (and Tony!). I think there are many synth-heads out there who have never even heard of this distinction prior to the release of the 0-Coast, because West Coast has been confined almost entirely to modular for 50 years.